I met a close friend of mine for lunch yesterday who is also a dedicated baker like me. While we were chatting I mentioned that one of the reasons why I love baking is that it reminds me that the natural world has its own perfect timing. We live in a world where ‘time is money’ and we end up pushing ourselves to an unnatural lifestyle. The natural processes in baking, waiting for the dough to rise, beating the eggs for a while until you get the perfect fluffy meringue, having to boil the water with the sugar for a while until it gets the right consistency to turn into caramel, remind me that you can’t rush life and you have to be patient for nature to take its course. I shared with her that for me baking is the best break from the chaotic daily lifestyle and stress and her response was that she feels the same. The conversation reminded me of an article I had read in BBC with the title Can Baking Make You Happier? . Here is a quote from the article ‘Baking helps lift my depression. It can’t cure it but it helps,’ Says John Whaite, last year’s winner of the Great British Bake Off. It is amazing to think how therapeutic baking and cooking can be. From stress to depression relief. From my friends and family I can always tell who bakes and cooks with love as their food tastes so much better. Over the summer we had visited a close family friend that is an amazing cook and baker. Her cakes, muffins, pastries are very original and delicious! All of them home made but you think you got them from the most expensive bakery. As she was treating us with some of her goods I complimented her by saying that her food is always so delicious and I can feel that this is cause they are baked and cooked with love. My comment touched her and she almost cried. She replied that for her baking and cooking is the way through which she expresses her love to her loved ones. I wish people nowadays took more time in the kitchen as not only it would help them regain a more relaxed approach to life but it would also improve the relationships with the people around them. So yeah I had been craving scones lately so I decided to bake some instead of buying ready made ones from the store. I looked into many recipes and I noticed that they are very similiar to each other. I combined a few and took inspiration from a recipe by Lesley Waters in which she added ground almonds to the ingredients. I love almonds and I am happy I tried it! We start by combining the liquid ingredients, milk and egg, in a bowl. In a separate bigger bowl we mix the dry ingredients, flour, almonds, sugar, baking powder and salt. We add the butter in the dry ingredients and we rub the butter with the flour until we get breadcrumbs. Initially we pour 1/3 of the liquid ingredients working the dough until the liquids get absorbed. Continue by adding the liquid mix slowly slowly until you get a soft workable dough. You might end up not using the whole quantity of the liquid mix. Leave the dough to rest for half an hour. Roll the dough until it’s 1.5 – 2 cm thick and cut with a cookie cutter. Grease a baking tray or cover it with baking paper and place the scones on the baking tray. 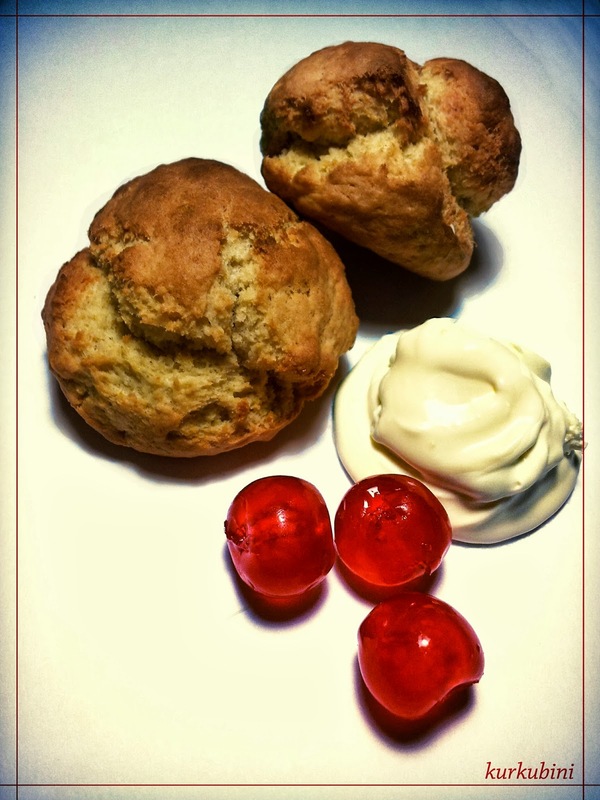 You can sprinkle some flour on top of the scones. We bake for around 10 minutes at 220 C in a preheated oven. We serve with clotted cream and jam!